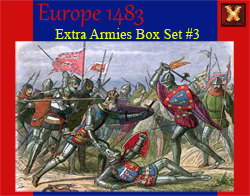 This is the Extra Armies Box Set #3 for Europe 1483. Europe 1483 can support up to 28 players, but comes with enough game pieces for 8. You will need this extra armies box and possibly others to more fully field the entire map with enemy player or non-player nations to fight. Enough game pieces for 3 large nations and 3 small nations.